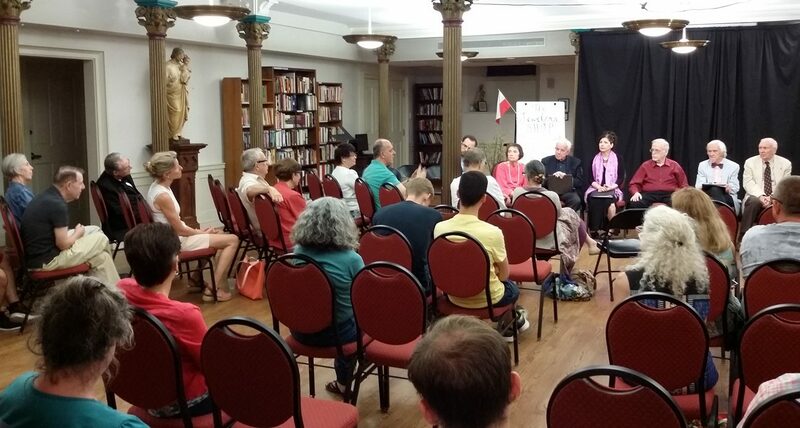 Parishioners and guests at Old St. Joseph's parish hall in Philadelphia enjoy a panel discussion with the performers in a staging of St. John Paul II's meditative play on marriage, "The Jeweler's Shop," Saturday night, July 15. 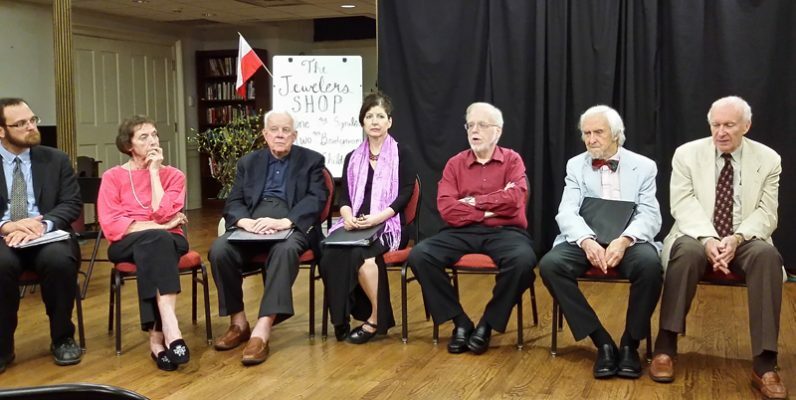 Old St. Joseph’s parishioner Joan Slavin, a member of the parish’s eldership group, spearheaded the effort to stage “The Jeweler’s Shop” and bring a spiritual component to a senior activity open to everyone. Community theater in its truest sense took center stage last weekend at Old St. Joseph Parish in Philadelphia. Members of the city’s first Catholic church gathered in Barbelin Hall to perform and discuss “The Jeweler’s Shop,” a play written by St. John Paul II. Under the direction of former pastor Father Daniel Ruff, S.J., and parishioner Peggy Connolly, a group of 10 parishioners delivered the drama’s meditative monologues, which explore the dimensions of marital and divine love. During its three acts, the characters spoke at length about their expectations of marriage and their struggles in it. Two mysterious figures, Adam and the Jeweler, helped the play’s three couples to situate their individual experiences in the context of God’s eternal design. With its sparse set and minimal gestures, the production — which featured performances on Saturday, July 15 and Sunday, July 16 — “required attentive listening of the audience,” said Father Ruff. The project was the brainchild of Joan Slavin, who heads up the parish’s senior citizens committee, or “eldership group,” a name chosen to highlight participants’ roles as mentors. During her career as an off-Broadway actress, Slavin observed that several small theater companies in New York City enjoyed good relationships with neighborhood Catholic churches. Upon moving into Old St. Joseph’s, she suggested that the eldership group produce the play as an alternative to traditional senior activities. Slavin posted a call for participants in the parish bulletin, and Connolly — a community theater veteran who holds a master’s degree in drama from the Catholic University of America — offered to direct. To enhance the spiritual impact of the production, Connolly tapped Father Ruff to serve as its theological consultant. 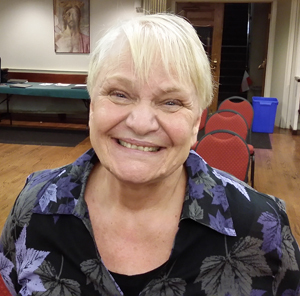 The Jesuit priest, who now serves as the campus minister at St. Joseph’s University, was already familiar with Connolly’s directorial work, having seen several of her previous productions while assigned to Old St. Joseph’s. However, he was initially hesitant to work on this particular piece. “I started with a disclaimer to the cast that I’m not an expert on the thought of Pope John Paul II,” he said, adding that he has now gained a much deeper appreciation of the saint’s theology. Cynthia Long, who played Teresa, was also skeptical at first. Attendees were both challenged and inspired by the seldom-performed drama. Parishioner Jeanmarie Zippo commended the cast on their performance, but felt that the piece was unrealistic. “It seemed to be written from the perspective of someone who had an idealized version of what marriage should be,” she said. After a successful debut, Slavin would like to see the eldership group stage additional productions. “I really believe so fervently that senior activities in a church should have that spiritual component,” she said, stressing the connection between art and contemplation. Connolly agrees that theater can deepen the soul’s relationship with the divine. The performers of the play by St. John Paul II discuss it and their roles during a discussion with guests after the performance on July 15. Play director Peggy Connolly is second from left and Jesuit Father Daniel Ruff, play moderator and a former pastor of Old St. Joseph Parish, is third from right.